Tag line: "Wayne's greatest role as an Indian fighting Captain !" Director John Ford’s eye for action, coupled with its breathtaking Monument Valley setting, helped make 1949’s She Wore a Yellow Ribbon an unforgettable motion picture, but it was John Wayne’s poignant, heartfelt portrayal of an aging Cavalry officer that made it a great one. As a result of the Battle of Little Big Horn, the U.S. Cavalry troops stationed at Fort Starke have been put on alert, and Capt. Nathan Cutting Brittles (Wayne) is assigned to quell any potential uprising the local Native Americans might be planning. Despite being only a few short days from retirement, Capt. Britlles leads his men, including his old friend and comrade, Sgt. Quincannon (Victor McLaglen); his eventual successor, 1st Lt. Flint Cohill (John Agar); experienced scout Sgt. Tyrell (Ben Johnson); and 2nd Lt. Ross Pinnell (Harry Carey, Jr), on what will undoubtedly prove to be a very dangerous mission. Also along for the ride are Abby Allshard (Mildred Natwick), wife of Capt. Brittles’ commanding officer, Major Mac Allshard (George O’Brien); and Olivia Dandridge (Joanne Dru), a pretty young woman who’s caught the eye of Lieuts. Cohill and Pinnell. Against his better judgment, Capt. Brittles has been asked to accompany the women to the nearest town, where they’re to catch the next stagecoach heading east. But with everything from hostile natives to gun runners standing in their way, it’s looking more and more likely that Capt. Brittles final mission will end in failure. When it came to staging action scenes, few directors were as effective as John Ford. In She Wore a Yellow Ribbon, we get a handful of exciting sequences, most of which revolve around the Cavalry’s run-ins with the Native Americans, who, following their recent victory against Gen. William Armstrong Custer at Little Big Horn, are preparing to attack Fort Starke. And while Ford would shoot several films in Utah’s picturesque Monument Valley, such as Stagecoach, My Darling Clementine, and The Searchers, She Wore a Yellow Ribbon makes the best use of this stunning locale, which, thanks to cinematographer William Hoch (who won an Oscar for his work here), is featured in almost every scene. As for John Wayne, he’s damn near perfect as Capt. Nathan Brittles, a proud officer and a brilliant leader of men who must deal with the fact that he’s reached the end of his prestigious 40-year military career. The movie’s most touching scene has Capt. Brittles receiving a watch from the entire company, a gift in honor of his retirement. The watch was clearly a surprise, but it’s the sentiment etched into it, “Lest we forget”, that almost moves him to tears. Only 42 when he appeared in this film, Wayne, aided by some fine make-up, does more than just look the part of a much older man; he embodies it. 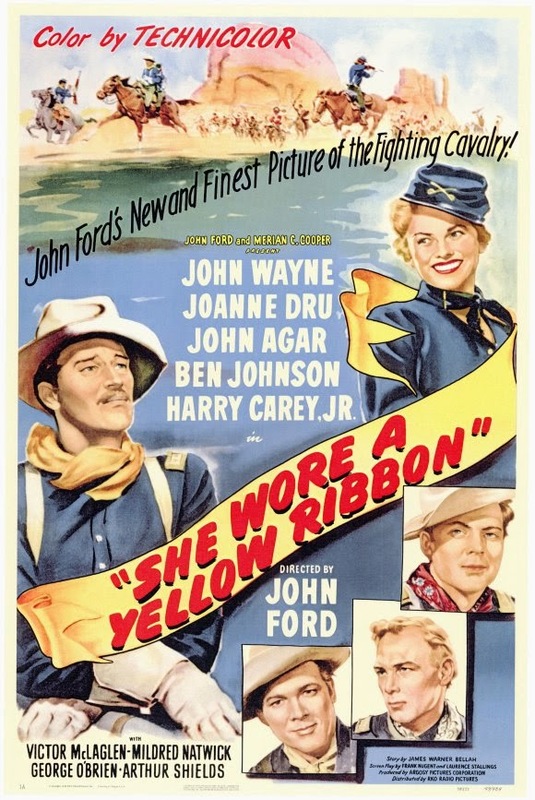 There are other strong performances as well, including John Agar’s (who’d go on to star in such ‘50s B-movies as Tarantula and The Mole People) and future Oscar Winner Ben Johnson’s (in She Wore a Yellow Ribbon, Johnson portrays Sgt. Tyrell, a Cavalry soldier who, a few years earlier, was fighting on the side of the Confederacy in the Civil War). Yet, despite their superior work, it’s John Wayne who ultimately steals the show. I always felt that Wayne deserved an Oscar for his turn as the bigoted Ethan Edwards in Ford’s The Searchers. After re-watching She Wore a Yellow Ribbon, I now think he probably should have won two. Love this post! Love this film. You got it spot on! Definitely my favorite of the "cavalry trilogy" (Fort Apache has many great parts, but it also has entirely too much "funny drunk Irish soldiers" shenanigans -- plus it has Shirley Temple).